A robust stakeholder and public engagement process will be employed throughout the project. 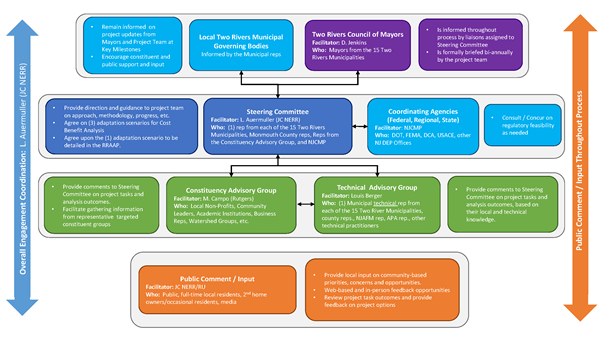 Stakeholders include elected officials, residents, community organizations, technical experts, local businesses, and environmental groups from the region. Stakeholder and public engagement will lay the foundation for identifying community assets and “ground truthing” appropriate actions. The Community Engagement Framework below demonstrates this process, along with announcements for upcoming public events. Volunteer for the Constituency Advisory Group! The Project Steering Committee (i.e. the deliberative body for reaching decisions regarding the NJ FRAMES Project) wishes to include the diverse perspectives of non-governmental stakeholders in their deliberations. As such, the Project Team is soliciting individuals to participate in the Constituency Advisory Group (CAG) as Members or Subcommittee Chairpersons. To volunteer, please email njframes@dep.nj.gov indicating your interest. Please share your name, affiliated organization, and the best way to get in touch with you. The FRAMES Advisory Groups are listed below. Description: the primary forum for analysis and plan development. Who: Local Non-Profits, Community Leaders, Academic Institutions, Businesses Reps, Watershed Groups, etc. Description: responsible for representation and engagement of appropriate stakeholders throughout the course of the project, and to provide input to the Steering Committee for comment and consideration. Description: advise on technical, legal, and policy feasibility of strategies under consideration, and will provide input to the Steering Committee for comment and consideration. Description: consult on the project, providing guidance and data as necessary, pilot a coordination process to better align activities by state and federal agencies in New Jersey, and appropriate to further the goals of the project.